Sheng Kong and Saikong Yang in The Tiger Among Us. Photo by Keri Pickett. 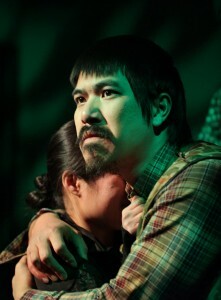 Lauren Yee‘s The Tiger Among Us (Mu Performing Arts performing at Mixed Blood Theatre, through Feb 10) sprawls. Literally: director Ellen Fenster utilizes Mixed Blood’s widest configuration and in her firm hands the play ranges from Dad’s extreme stage right deer stand, to the car (we assume it’s a Minnesota beater) located on the extreme stage left, and everything in between. Fenster’s production moves. Scenes crash into scenes, doors slam, dreams (some quite violent) get played out, chickens are sacrificed (staged with simple yet breathtaking realism), noses bleed, buried photographs are dug up. She keeps the energy level high, the play entertaining. And The Tiger Among Us sprawls dramaturgically: it leaps from living room realism into dreams and fragmented flashbacks, to characters who change mid-scene into hallucinatory figments, to characters who are entirely ghost figures. The story of a Hmong family living in a small town in northern (one assumes) Minnesota works. Dad is the school janitor, his daughter Lia (played with solid emotional resonance and cheerful energy by actor Gaosang Vang Heu) obsessively plays volleyball. Her brother Pao (in a sweet and entertaining, if occasionally over-the-top performance by Maxwell Chonk Thao) is at loose ends, dreaming of life in the Big City (St. Paul). Nice performances are turned in by Claire Bancroft as Lia’s best chum Selma and (especially) by Garry Geiken in effective multiple roles. The portrayal of the Hmong family – the only Asians in town – works. Ah, but Yee is frying other fish. She evokes, using dreams and hallucinatory flashbacks, the Hmong diaspora. Driven out of his native Laos, Dad crosses the Mekong into Thailand with his pregnant wife. Life intrudes, viciously. Eventually Dad ends up in chilly Perham, MN. There he tries to hide, from his ghosts – especially that of his deceased wife – seeking solace in solo deer hunts. And from his children, who try to embrace, without help from Dad, Hmong culture. Rich material. Which does occasionally frustrate. Every time the diminutive and pregnant dream-May (played with simple elegance by Sheng Kong) entered, she took my breath away. Thus I was disconcerted by the scene which seems to suggest that May remains alive, that 18 years earlier she deserted her family. This was confusing and was, in my less-than-humble opinion, a diminishment of her presence. But I could be wrong. I am so often. Finally, I cannot praise enough the work of Saikong Yang as Dad. Underplayed and stolid, often speaking Hmong, a remote yet somehow vivid presence, one completely understands the hold he has on his children. One feels his need for solitude, the building presence in his life of the ghosts of Laos. Fenster really “gets” this character: always presented in half light, Dad becomes a powerful, quixotic, hulking presence. Yang makes the ending, the specifics of which I have no intention of revealing, work. Marvelous. Is The Tiger Among Us the best-made play currently running? It is not. Does it work? You betcha. For more info on John Olive, please visit his website.